Mini barns, storage barns, and horse barns are a few of the popular styles of home barns built by Amish in Indiana and other communities across America. Amish barns have enjoyed a good reputation for quality craftsmanship and value. Residents of the Hoosier State can find an Amish barn retailer near most major IN cities, including Indianapolis, Fort Wayne, Evansville, South Bend, Elkhart, Bloomington, Hammond, Muncie, and others. Scroll down to find an Indiana Amish barn company in the listings below. Read more on the Amish in Indiana, or find Amish barns in other states. Indianapolis-area supplier for quality built outdoor structures including mini-barns and gazebos. Barns Unlimited is an Amish owned business operated by Amos Esh. Bontrager Sheds provides hand-built mini-barns in the Nappanee area. Located a one-hour drive northwest of Fort Wayne and a half hour south of the South Bend/Mishawaka/Elkhart area. Business owned by William and Samuel Bontrager. Kids Zone USA features mini barns and gazebos made by skilled Amish woodworkers from Middlebury, IN. Located in the sizeable northern Indiana Amish settlement. Kuhns Storage Barns is a Nappanee-area outdoor structure provider. They offer a range of products such as storage barns, mini-barns, gazebos, playhouses, cabins and horse shelters. This business offers outdoor structures including mini-barns and gazebos. Rabers Portable Storage Barns is located a 2 hour drive south of Indianapolis in the large Amish community in Daviess County. Amish Structures provides Amish-built barns along with a choice of sheds, gazebos and outdoor furniture. Some barn building options include pressure-treated runners and floor joints, duratemp, wall studs, roof sheeting, plywood, hooks/eyes to secure doors while opening, double doors and more. Amish Structures is a Michigan City-area dealer for Amish-made outdoor buildings reachable from south/east Chicago, Hammond, Gary and other northwestern Indiana locations. Please double-check hours of operation of Indiana Amish barn sellers listed above. Locations and hours can change. Amish-owned companies will be closed on Sunday due to Amish religious beliefs. Non-Amish barn dealers may be open however. Not responsible for changes to the above. A half-century ago, Amish were defined by their commitment to agriculture, with dairy and other varieties of farming a dominant occupation in many communities. Today, Amish have shifted into a diverse set of occupations, including manufacturing and run-from-home cottage industries. Amish in Indiana have held to this pattern. While Amish dairies can still be found across Indiana, in many communities Amish have moved away from plows and pitchforks into craftsmanship and manufacturing. Notably, Amish in northern Indiana are heavily active in the RV manufacturing industry, while Amish in the southern community of Daviess County produce large amounts of furniture and cabinetry. Making barns and storage buildings is an important part of the Amish occupational landscape, and you’ll find a number of Amish storage structure builders in the state. Barns may be constructed on-site at an Amish location, for delivery to a customer within the state or beyond. 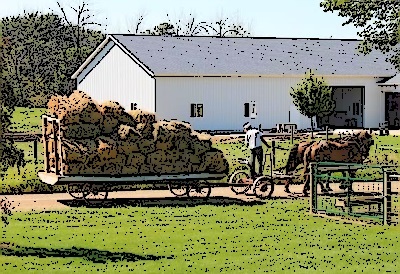 Amish companies may hire non-Amish employees who in addition to contributing labor, can provide services such as a delivery vehicle. Purchasing an Amish barn in Indiana is relatively easy, either by visiting a dealer with numerous models to choose from, or who can provide custom ordering arranged through an Indiana Amish barn manufacturer. Given Indiana’s significant Amish presence, Hoosier state residents have a number of options for Amish-made structures, including buying direct from an Amish source. With the nation’s 3rd-greatest Amish population, Indiana is home to Amish settlements from north to south and most points in between. Nearly two dozen Amish communities are found within the state’s borders, including America’s 3rd-largest in Elkhart and Lagrange Counties, large communities lying both north and south of Fort Wayne, and a significant southern Indiana presence in Daviess County, home to thousands of Amish residents. Besides finding an Amish-barn at the mostly non-Amish owned retailers listed above, some prefer to locate an Amish barn manufacturer and purchase their storage building straight from the source. While this route entails a little more footwork, it is a viable option, especially if you don’t mind a few trips to Amish Country. Listed below are some details on some of the larger and more prominent Amish communities in the state. For more information, check our main page on Amish settlements in Indiana. Elkhart/Lagrange Counties: Indiana’s most populous Amish location. Over 20,000 Amish live in this settlement. The Amish in this area are heavily involved in recreational manufacturing, employed by the many companies scattered through the region. However a number of Amish are involved in construction and manufacturing. Parke and Wayne Counties: These two communities, located on opposite ends of the state, are home to Lancaster County, PA transplants. Founded 20 years ago, these growing communities have a number of manufacturing businesses as well as farm operations. Daviess County: A populous community in the hilly terrain of southern Indiana. Construction is a significant industry here, as is small-scale manufacturing. Over 4,000 Amish make their homes in Daviess County. See http://www2.etown.edu/amishstudies/Largest_Settlements_2013.asp for more on the country’s largest Amish communities. Hi Tom, I might have someone who can help you. If you’re still interested, drop me an mail at ewesner@gmail.com . I, too, am looking for someone to build a pole barn. I’m in Leavenworth, IN 47137. Do you know of anyone who can build a 40×30 barn? Robert Graber Salem, IN 812-896-3328 – I don’t how far they are willing to travel. See my post below. Looking for Amish barn builder, needing a 38 X 48 Gambrel style barn built for commercial business in bottom, w/ living quarters in top. Will need plumbing, electrical, and architectural engineered drawing to support commercial building in Dearborn Co. IN. Have already started getting approval for septic system, wanting to have it completed by October 2018. Levi is who I talked to. I am very pleased with their work. They deliver everything on site you just have to have a graveled access and a flat leveled area to build on. Hello, I live in Baroda Michigan about 25 minutes north of South Bend and for the past few months have been researching and looking for a company to provide an Amish pre-fabricated horse barn. 2 stalls, 1 tack room, full loft with lean-to. I have found a couple companies but they are hundreds of miles away such as in North Carolina and Pennsylvania. I cannot seem to find anyone more local and I am insistent on the Amish built. Any recommendations would be greatly appreciated! I recently had a 24×32 pole barn garage built with one entry door and a 16×8 overhead door. Three Amish men built the garage in a total of 15 hours and it looks great. I would recommend Mr. Robert Graber of Salem, Indiana to anyone that needs a barn put up fast. It took a while to get to me for my garage because they were very busy, but he was there bright an early on the both days of the build. I’m looking for someone who can move a 24’x24′ pole barn about 500′ in same yard. Would need to add support before moving. I live in Michigan City, IN 46360. Hello, my name is Scott Thomas Sieg and I am the Events & Theater Coordinator for WNIN. We are just weeks away from our 2019 Spring Auction which is being held on Monday, April 22nd to Sunday, April 28th from 6:00 p.m. to 10:00 p.m. In years past, we have received donations from local business and one in which is a yard barn. However, since last year, that business has closed their doors which puts us in search of additional items for this year’s Auction. We are hoping for donations from local businesses to donate patio furniture, yard barns, grills, lawn mowers, etc for this year. Your business would be plugged and reach the thousands of households in the Tri-State Area community. Your donation gives us the opportunity to continue both television and radio programming as we are a non-profit. Please feel free to reach out and respond. Thank you in advance!